Customer Contact Week (CCW) Europe, asked 4 customer contact experts for their advice on chat bots, why it’s important to keep the human element when automating and how to do it! In today’s technological business world, customers want efficiency and authenticity when communicating with their favourite brands. Advancements in artificial intelligence, coupled with the growth of social media messaging is fueling the development of chat bots that can both listen and provide relevant and personalised responses to customer queries. Unsurprisingly, businesses are starting to foresee immense potential in this increasing bot economy, but amongst all the hype is the potential for this evolving technology to go horribly wrong and instead, and force customer disloyalty. 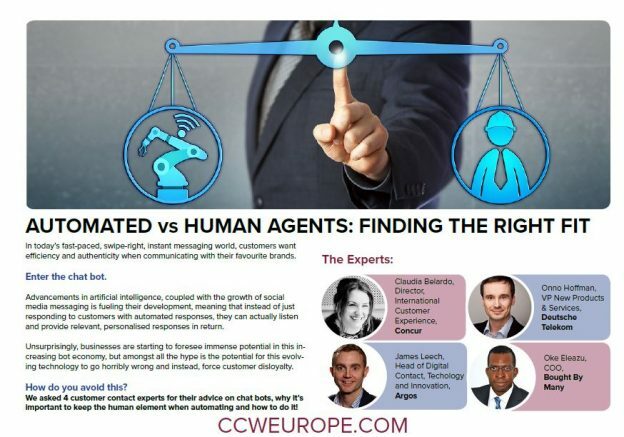 CCW will be discussing automation, the human element, chatbots and their future in the customer contact sphere at CCW Europe – taking place on the 12-15 March 2018, Glasgow, Scotland. Be the first to comment on "Automated V Human Agents – Finding the Right Fit"